The Department of Game and Fish will conduct roadblocks throughout the state during spring and fall hunting seasons in an effort to collect harvest data and to apprehend wildlife law violators. CARLSBAD -- The Department of Game and Fish will discuss development of a recovery plan for the blue sucker and the gray redhorse, species native to the lower Pecos River drainage, at a public meeting April 1 in Carlsbad. The meeting will be at 6 p.m. at the Bureau of Land Management office, 620 E. Green St. The Wildlife Conservation Act requires a recovery plan for restoration and maintenance of each state-listed species in New Mexico. At the meeting, the Department also will recruit members of an advisory committee to assist in development of the plan. 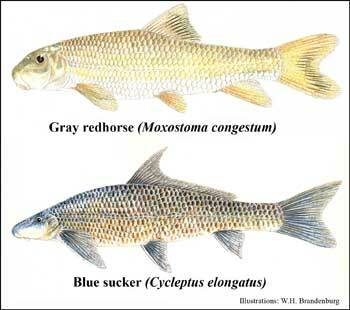 A copy of the agenda and more information about the blue sucker and the gray redhorse is available from Stephanie Carman, Department of Game and Fish, P.O. Box 25112, Santa Fe, NM 87504; (505) 476-8128, or stephanie.carman@state.nm.us. If you are an individual with a disability who is in need of a reader, amplifier, qualified sign language interpreter, or any other form of auxiliary aid or service to attend or participate in the hearing or meeting, please contact Shirley Baker at (505) 476-8030, at least 3 working days before the set meeting date. Public documents, including the agenda and minutes can be provided in various accessible forms. Please contact Baker if a summary or other type of accessible form is needed. A recovery plan for two state-endangered riparian rodents, the meadow jumping mouse and the Arizona montane vole is ready for public review and will be presented to the State Game Commission at its meeting April 11 in Santa Rosa. 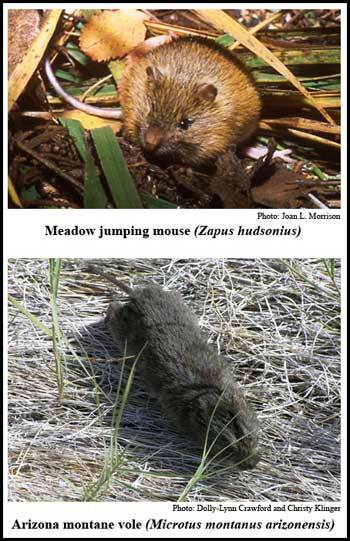 The meadow jumping mouse (Zapus hudsonius) is found in the Jemez, Sangre de Cristo, Sacramento, and potentially the San Juan mountains. Recent surveys indicated a 67 to 91 percent decline in populations throughout the state. The Arizona montane vole (Microtus montanus arizonensis) is found in a very small region in Catron County. The recovery plan was developed by the Department of Game and Fish and an advisory committee of individuals representing private and public interests. It can be found on the Department website, www.wildlife.state.nm.us by clicking on the "conservation" tab. Comments about the plan can be sent to Leland Pierce, Department of Game and Fish, P.O. Box 25112, Santa Fe, NM 87504; (505) 476-8101; leland.pierce@state.nm.us; of fax to (505) 476-8128.